I know that's a strange title for an article. But let me explain. I took my family for a test drive in a Tesla Model S P85+ back in 2013. I was hooked. So were the kids. (The wife took a little more convincing.) But a sedan, even a roomy sedan with the ability to seat seven (sort of), wasn't an ideal choice for us at the time. Then I saw the video for the upcoming Model X. OMG, those FALCON-WING DOORS! Seating for seven. Loads of space. I NEEDED THAT! O-M-G — Get Me Out Of This Gasmobile! If you confirmed a Tesla Model 3, Model S, or Model X order before February 1 but forgot or neglected to provide a referral code for 6–9 months of free Supercharging, fear not — you can still do so! 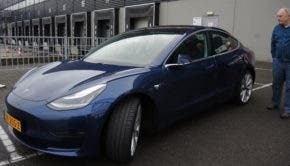 CleanTechnica writers now have 6 Tesla Model 3s, 3 Tesla Model Ss, 2 Chevy Bolts, 1 Nissan LEAF (after 2-3 retired Nissan LEAFs), 1 BMW i3, 1 Peugeot iOn, 1 Kia Soul EV, and 1 Zero Motorcycle. That makes 15 electric vehicles — if you don't count the electric bikes we have as well! I Bought A Bolt Today — Or … Does GAS trump FUD?